Food is just one tempting reason to visit Jamaica. The Caribbean’s third-largest island also boasts offshore reefs, underground caves, mountains, waterfalls, beaches, brightly hued flora and fauna, a famously laid-back vibe, reggae and many more compelling invitations. The food, though, is reason enough. It’s hauntingly delicious: I still dream about a steaming bowl of spicy pumpkin soup I devoured on the island years ago. 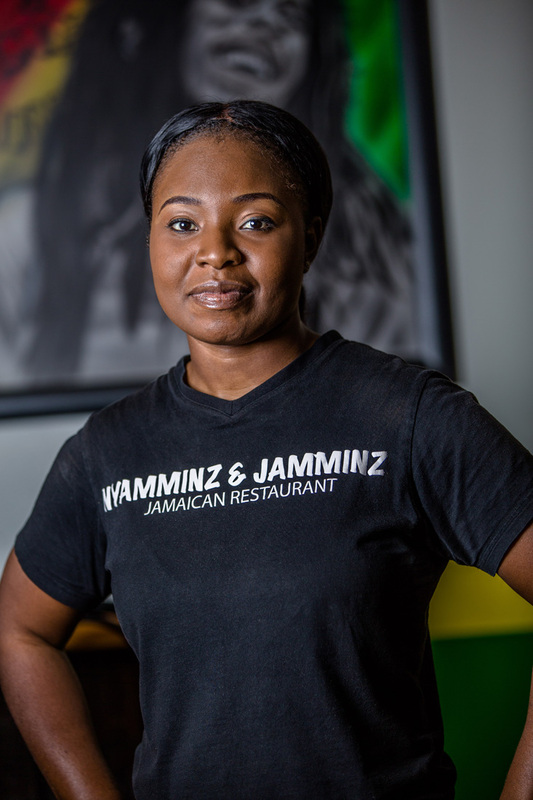 To satisfy cravings for Jamaican flavors between flights out of Atlanta, head to Nyamminz & Jamminz Jamaican Restaurant in Little Five Points for authentic, quality tastes. Finding Nyamminz & Jamminz can be a challenge. The restaurant, which opened November 2015, is at the end of a hallway inside 1083 Euclid Ave. N.E., and several businesses have signs out front. 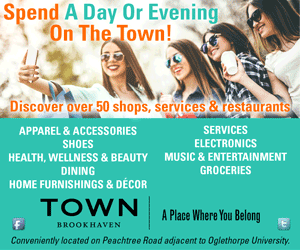 Parking on Euclid Avenue can be tricky, though a weekday afternoon offers more options than a Saturday evening. Persevere and overcome any hassles, though; one bite is all you need to be convinced it’s worth the effort. Beef patties. Other patty options include veggie, chicken or spinach. The small restaurant is owned and operated by two sisters, Sandy and Whitney Walker. The dining area offers limited seating, just a small counter with stools and a few tables. The white walls wear bright green and yellow stripes plus a few near-neon paintings, including one of iconic Jamaican singer-songwriter Bob Marley. A refrigerated case holds Caribbean sodas and juices. The menu hangs behind the order counter, where the smiling cashier/ chef/co-owner stands ready to answer questions, slide credit cards through a Square and pack generous servings of your selections into Styrofoam containers. Jamaican cuisine has ª number of influences, with Amerindian, Spanish and African cooking traditions topping the list. One-pot stews, barbecue and complex seasonings are common themes. Modern approaches to traditional recipes include an increased emphasis on local, seasonal fare and incorporating healthy cooking techniques. Jerk chicken, the island’s most famous dish, is generally considered a national treasure and thus a closely guarded secret. In all the years I’ve been asking Jamaican chefs what’s in jerk, I’ve only been able to find out that key ingredients include scallions, scotch bonnet peppers, thyme, onion, garlic, ginger and “seasoning mix”—but I haven’t yet persuaded anyone to disclose the details of what goes into that mix. The chefs at Nyamminz & Jamminz are equally evasive. “Pimento,” is all Sandy would say. But the jerk chicken here matches my memories of island fare. It’s fall-off-the-bone tender, juicy and spiced to tingle taste buds without stepping over the line into the burn zone. No surprise, it’s the restaurant’s most popular dish, and its quality is to the next. A large order includes four pieces of chicken plus three sides: festivals (or fries); rice and peas, or white rice; and cabbage or mixed vegetables. Even if you dislike chicken, you can order jerk: Nyamminz & Jamminz also offers jerk pork, tofu, fish and shrimp. 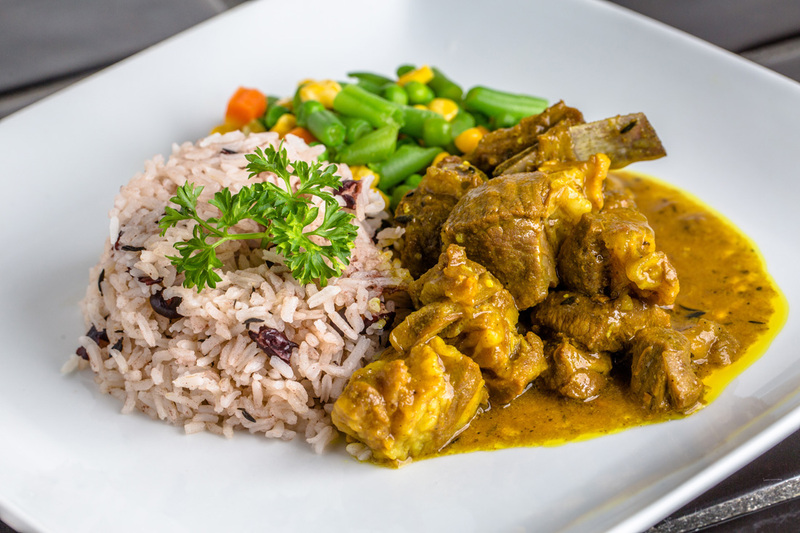 Jamaicans commonly serve curried goat to house guests because it’s oh so good. Goat meat tastes similar to lamb; curry is a fabulous way to prepare it because spicy flavors mitigate gamey ones. Bite carefully—chunks of bones lurk in the dish, but your fork can usually tap them out to avoid surprises. Nyamminz & Jamminz’s curry packs spicy heat that creeps toward blazing hot. 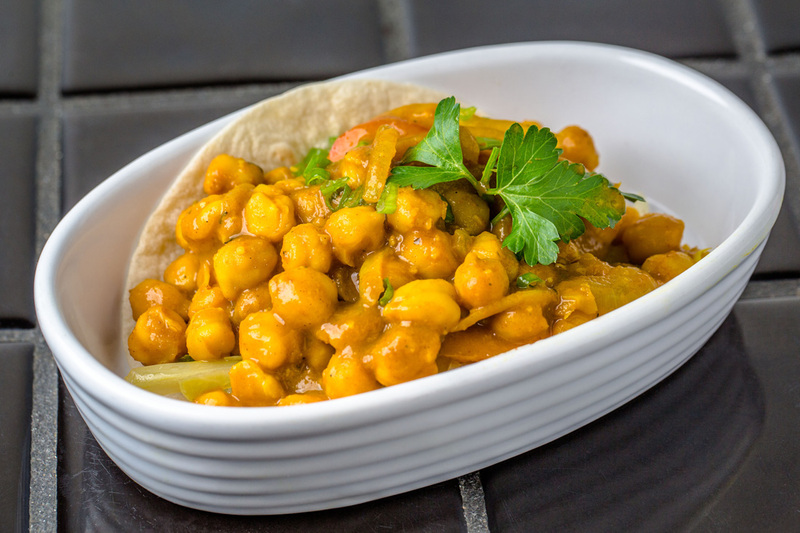 If goat sounds too adventurous for your palate, try the curried chickpeas, either piled high on a plate or tucked into a soft wrap. While dishes of jerk, brown stew chicken and oxtail stand hot and ready to scoop from warm pots, fresh fish can take extra time to prepare. In that case, order a side to snack on while you wait. 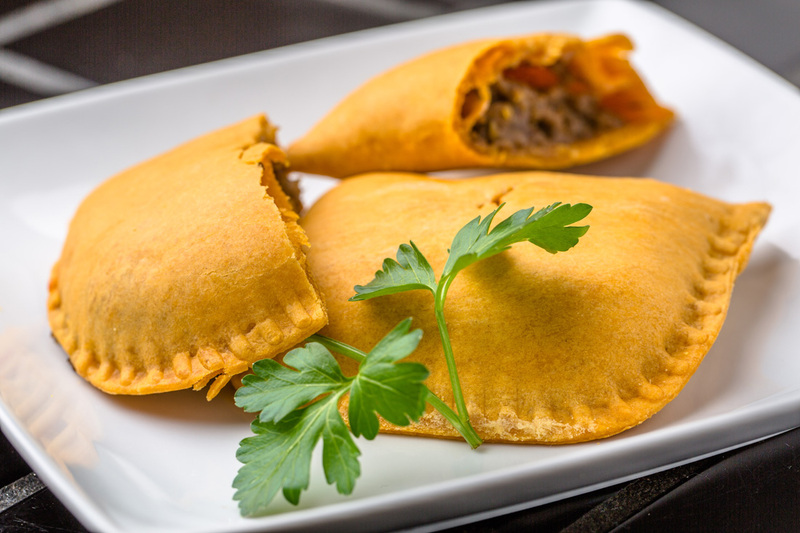 Patties are flaky, golden yellow fried pastries filled with spiced beef, chicken, veggies or spinach. 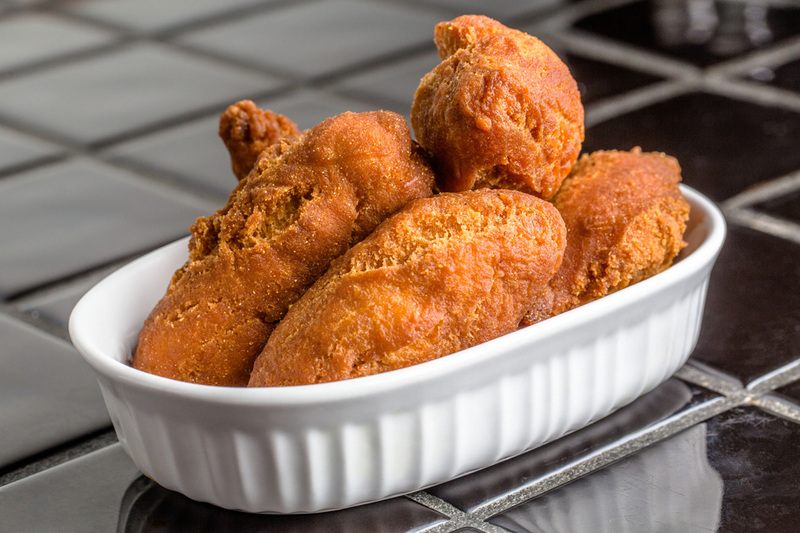 Festivals are fried cornmeal dough that’s crispy-crunchy on the outside yet soft-gooey on the inside, offering a sweet contrast to spicy entrées. Sandy says, “They’re like hushpuppies, but better.” Thirsty? Sorrel and ginger juice is refreshingly tangy. I ordered callaloo and saltfish (dried and consistent from one visit salted cod) because it’s the only dish on the menu that contains callaloo, a leafy green sweeter than collards that I adore; the green is not available as a side. The fact that the saltfish overpowers the vegetable didn’t stop my husband and me from devouring every bite. I’d planned to order kingfish with escoveitch, a tangy sauce made from onion, spices, vinegar and scotch bonnet peppers. But to avoid a half-hour wait, I got the brown stew chicken instead. Saucier and darker than jerk but equally spicy, it’s a new favorite. If you wait for an order or opt to eat on site, odds are dozens of other customers will come and take orders to go during that time. A steady flow of hungry folk drops by even at hours I’d have expected to find the place empty. Whatever you order, generous portions are heaped into containers. Leftovers reheat well and taste like a trip to Jamaica— without airports or parking considerations. What’s your favorite ingredient to cook with? Natural herbs and spices. We use a lot of thyme and pimento. What’s your personal favorite dish on the menu? Curry goat. Jamaican cuisine is best known for jerk. Curry is kind of Indian, but Jamaicans adopted it a long time ago. Goat and chicken curry are the best known. Is it a challenge to find authentic ingredients? No. We get most of our ingredients from H Mart, DeKalb Farmers Market and Restaurant Depot. What brought you to the kitchen? I earned an associate degree in food and beverage management in my early teens. I’ve always loved being in the kitchen. I learned cooking at an early age from my mom. Recommended: Beef patty ($2), jerk chicken ($10 small, $13.50 large), curry goat ($11.50 small, $15 large), brown stew chicken ($9.50 small, $13 large). 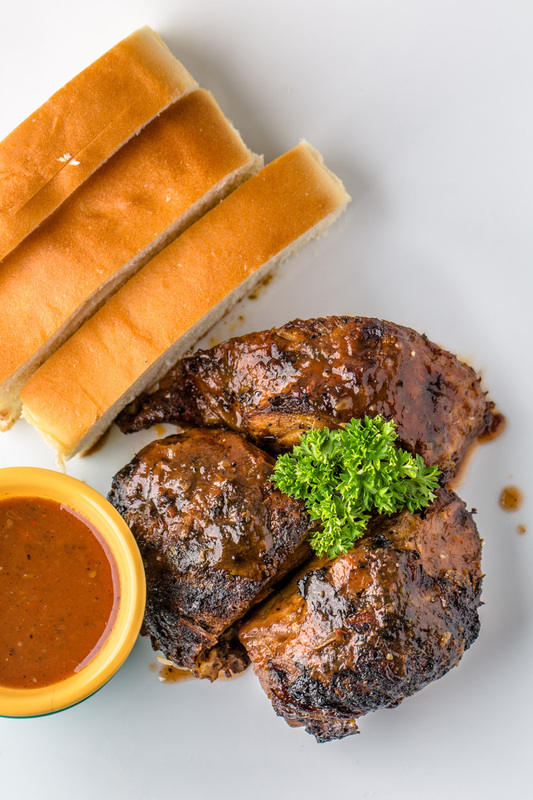 Bottom Line: Nyamminz & Jamminz serves quality, authentic Jamaican fare in generous portions at value prices. The space is very casual with limited seating; most guests take orders to-go.